I'm slowly (well, maybe not so slowly) getting organized now for my sewing projects. I've got my fabric all lined up and ready. I've organized all my patterns by manufacturer, then by pattern number, and my sewing space is taking over my papercraft space. Of course, I still have a lot of "weeding out" to do of the old crafts, but it's progressing. 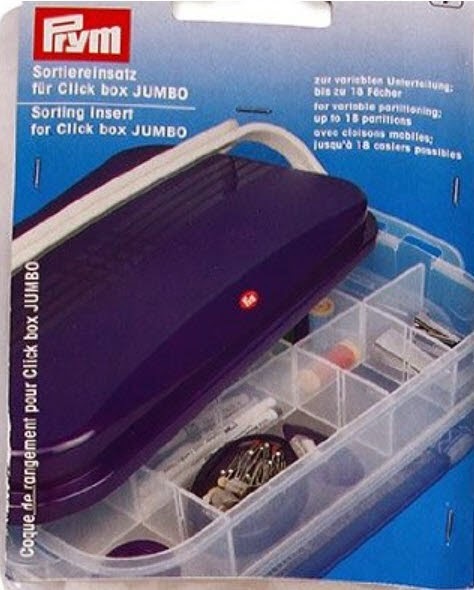 It's called a Prym Jumbo Click Box and it surely IS "jumbo", but very lightweight and I think it's going to be just right. It came with the two boxes (7 liters each) and a lid. I've also ordered an extra box, which will be here next week. The plan is to use the top box for small supplies. I ordered a divider insert for that top box and have now put all my small supplies in there: needles, thimble, tracing wheel, seam rippers, tape measures, etc. In the second box, I've got my pinking shears, dressmaking shears, bobbin box, bobbin winder, and other things that wouldn't fit in the divider. This is the divider insert. Several people online have said they use this system for their sewing supplies, also, and have found it ideal. 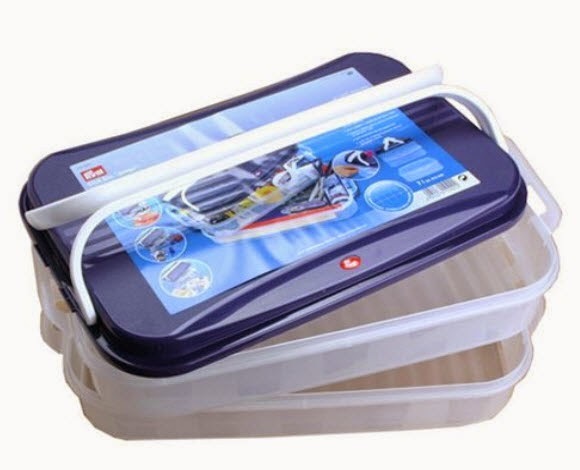 I'll use the bottom box, when it comes, for storing things like fat quarters, interfacing, batting, quilt rulers, etc. as the need arises. My only complaint would be that the little "click" bit to open the box is pretty stiff and I can see a broken fingernail in my future. I'll just have to remember to go slowly and maybe use a key or something to pop it open until it's been opened a few times. I've also spent much too much time online looking at sewing rooms. Just try a google search for "sewing room images" -- or Pinterest search for similar.... you'll lose a couple of hours! And then there are the sewing forums, the sewing online shops, and... take a deep breath... the YouTube videos for every kind of sewing technique, sewing project, sewing room decoration, or anything else related to "sewing". I found a project on YouTube for making a cell phone ("mobile" phone in the UK) case that is just what I've been looking for. That will probably be my next blog post! And thanks to the people who have left comments. I get very excited when I think someone has bothered reading this! I am slowly gathering stuff together too, will get started soon ... LOL. I have several of the small Prym boxes for my inkpads, they are perfect and I have been eyeing up the large one for a while! My friend has one of these for taking to scrapbooking crops..they work perfectly for it too. I enjoy reading your blog Jane..do keep it up.